Super Soft & Absorbent Protection Makes Every Car Seat Accident-Proof! 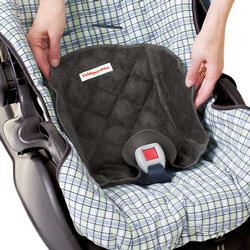 The PiddlePad protects car seats, stroller seats or most infant seating from diaper blowouts and potty-training accidents. The harness shield protects the hard-to-clean crotch-harness latching system from the mess, as well. Two layers of terrycloth provide a soft seat with high absorbency, while the sealed vinyl backing protects the seat and seat belts. • Non-slip, waterproof outer layer prevents leaks. • Unique bucket shapecontains the mess!